Langrisser Mobile features over 30 heroes. You will get the two heroes; Lance and Scott in the summon tutorial. After that, you can spend trinity vouchers for more heroes. By level 11, you can easily earn more than 10 trinity vouchers and spend in 10x summon. Since the SSR rate is only 2%, rerolling would not be quite useful because the auto-battle mode unlocks at level 10 and it takes up to an hour to reach that milestone. So before level 10, you will have to play each battle manually; that’s time-consuming and does not guarantee a good SSR unit. Note – As per the current event reward, you get the first SSR unit Dieharte for free. In today’s post, we have covered the Langrisser Mobile reroll guide and shared Langrisser Mobile Tier list. There are multiple ways to reroll in Langrisser Mobile; create an account on each server, use clone app, use emulator, use multiple Facebook accounts(that’s too annoying though). 1.) Server -> You can create one account on each server. On the login screen, you get the option to change the server. Select a new server and create a new account. After that, complete the missions, achievements and earn trinity vouchers. Spend these vouchers on 10x summon(guarantees 1 SR). Go to the store and spend crystals for trinity vouchers. Repeat the same steps in all the accounts and continue with the best one. 2.) Clone App -> If you are on Android, use Parallel Space app for rerolling. After installing Langrisser Mobile in Android, open the parallel space app and clone Langrisser M. Login as a guest account. Follow the same steps mentioned in above point to earn trinity vouchers and spend on 10x summon. If you don’t get the units you want, go to Android settings -> apps -> Parallel Space -> clear its data. After that, open the Parallel space app again -> clone LM -> login as a guest -> repeat the steps until you get the desired units. After getting the desired units, bind the account to Facebook(also, clone the FB app). Can I bind the account after choosing the guest as login option -> Yes! Tap the player avatar at the top-left corner -> bind Facebook or Bind Google(N/A in Parallel Space). 3.) Using Emulator -> It’s quite complicated. If you don’t want to waste precious time, we would not recommend you to use this method. In the emulator, you can use the same method(clone app) for rerolling. Or create multiple instances of the device using LD emulator. For the video tutorial, click here(It takes you to the YouTube). 4.) Facebook Account -> Use a new FB account for rerolling. At the top-left corner of the game screen, tap the player avatar -> switch account -> use another FB account to login. You can check the list of best characters for PvE/PVP in this post(Opens in a new tab). 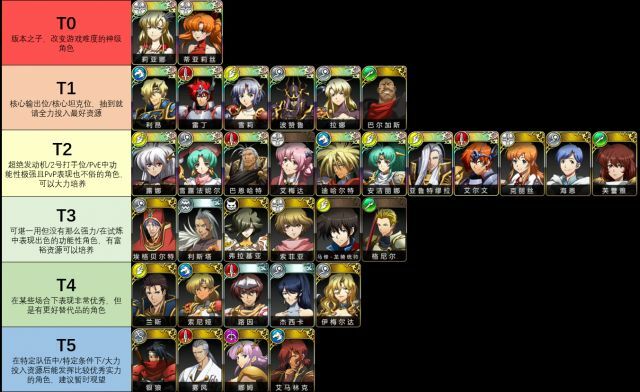 And, click here to see the picture of below Langrisser Mobile tier list. Liana – She is a Holy type SSR unit. She can remove debuffs and heal allies. Tiaris – She is another Holy element SSR unit. She can heal allies with her powerful healing skills. Liana is more offensive, while Tiaris is more defensive. Both are the best healers in the game. All these are SSR rank heroes, except Vargas who is an SR unit. Leon -> OP unit, one of the best attackers in the game. He has attacking as well as defense buffs, activated when you move on the battlefield. Ledin -> Ledin is an infantry unit, one of the best tank type heroes in the game. Skills(including class skills) – Reduces damage, increases the defense, attack power. Cherie -> Cherie is a flier unit. You can get it for free by completing the 60 Points in the path of the light event. And, you always have the option to draw her from the summon. Skills(including class skills) – Increases critical hit rate, reduces damage, get extra turns after killing an enemy. Lana -> Lana is another hero in Langrisser Mobile Tier list. She is a mage type hero with unique Arcane extension skill that increases the mage damage. Skills(Including class skills) – HP recovery, AoE, Resurrect, and more. Vargas -> Vargas is an SR unit, Holy Element. A good tank type character with amazing skills(including class skills); reduces damage taken, increases defense. Luna -> SSR unit, Holy Element. Reduces mage damage taken(for allies also), increases MDEF. Classes skills – Increases damage/defense, reduces damage taken. You can check the classes skills in the profile menu of the character. Bernhardt -> SSR unit, Infantry element. Another good tank type character with high damage and many good skills(including classes) – increases damage, reduces enemy ATK/DEF of enemies, increases defense, reduces damage taken. Almeda -> She comes with N rank rarity, but you can grade up her(from N to R). She is a debuffer, can restore the health of allies. Classes Skills – HP buffs, Increases attack/defense. Dieharte -> SSR Unit, Cavalry. Skills – Increases Crit, damage and has mobility passive skill. Altemuller -> SSR Unit, Infantry. Reduces damage taken, increases ATK, increases DEF(class skill). Elwin-> SSR Unit, Infantry. Increases damage/ATK, recovers HP. Class Skills – Reduces damage taken, increases DEF, Crit Rate Up, and more. Chris -> SR Unit, Holy. Buffer, can remove the debuff, increases defense, damage. Hein -> SR, Infantry. You can advance it to saint class for attack buffs/skills. His initial talent increases the INT stats for a few turns. Freya -> SR, Lancer. Freya is another good unit you can build and put it on the team. She has decent skills which increase damage, reduces enemy defense, reduces damage taken. Lance -> You get this hero for free in the first phase of the game. He has AoE damage skill, Battlefield Mastery talent that increases ATK/DEF. Advance it to dragon master class for more ATK/DEF buffs and the passive skill that reduces DEF of all the enemies. Leticia -> R unit, Cavalary. Increases ATK, DEF, the mobility of nearby allies. Advance it to the final class for further skills like reduction in damage taken, an increment in damage power. Jessica -> R Unit, Infantry. Jessica is one of the best rare units in Langrisser Mobile game. Her teleport skill lets you teleport ally to any block within range. Additionally, you can easily obtain Jessica. Also, she has ATK/DEF/INT buffs. Imelda -> SR Unit, Infantry. Increases soldier damage, stats of all the allies. Advance her to further classes for ATK/DEF/HP buffs. Lewin -> R Unit, Infantry. Increases soldier ATK/DEF stats, restores HP after the battle. Silverwolf -> SR Unit, Holy. Increases ATK/DEF(Max 9%), upon CRIT Hit, steals 1 buff from the enemy, reduces damage taken, increases CRIT damage. Kirkikaze -> SR, Infantry. Increases CRIT rate, reduces cooldown, upon CRIT ATK, restores HP. Narm -> SR, Archer. Increases ATK, reduces enemy mobility. Advance her to the ranger class for further skills; increases damage. Emerick -> SR, Cavalry. Increases attack power, reduces enemy mobility, reduces damage taken. Advance him to final class for more skills; Increases DEF/ATK.